Guitarist Scott Wolf is being widely recognized for his versatility as a performer, teacher, and arranger for classical guitar. Scott most recently received his Doctor of Musical Arts from the University of Southern California, where he studied classical guitar with renowned pedagogue and Los Angeles Guitar Quartet member Scott Tennant. He earned a Master of Music from New England Conservatory under the tutelage of Eliot Fisk and received his Bachelor of Arts at UC San Diego with Dr. Randy Pile. A frequent competition prizewinner, Scott won first prize in the Donald Miller Concerto Competition in 2009 and was awarded the "Latin American Prize" at Boston GuitarFest 2007 for his fiery interpretation of Latin American and Spanish music. Shortly after, he released a solo album of Latin-American music entitled Un Viaje al Sur (A Journey South). 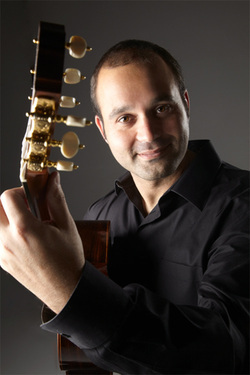 He also studied flamenco guitar extensively in Spain and in the U.S. with Grisha Goryachev and Adam Del Monte. He has since been a guest instructor of flamenco guitar at the Guitar Foundation of America Regional Symposium and the Loyola Marymount International Guitar Festival. Scott has performed in numerous public master classes for such renowned pedagogues as Pepe Romero, Roland Dyens, Adam Holzman, Rene Izquierdo, Joaquin Clerch, Nicholas Goluses, Carlo Marchione, Paul O’Dette, Alexander Dunn, Eduardo Fernandez, Gerd Wuestemann, John Schneiderman, and Flavio Cucchi. He has also served as assistant to the director at both the Guitar Foundation of America in La Jolla, and the Boston GuitarFest. A dedicated teacher, Scott serves on the faculties of both Oxnard and Whittier colleges. Devoted to expanding the chamber music repertoire for guitar, Scott performs many of his own arrangements with the USC World Guitar Ensemble, Duo Solaris, and De Gracia y Pasión. He has publications available from Clear Note and Doberman-Yppan Publishers, as well as his latest arrangement: Escenas - Five Cuban Dances by Ignacio Cervantes, which is available for purchase at his concerts and via his website.